Join us on Saturday, June 22 at Hamilton’s Bayfront Park for a fun and family-friendly bicycle ride to help defeat Duchenne muscular dystrophy and help save the lives of boys like our Max. You can choose from our 6 km ‘Single Scoop’ car-free route or opt to stretch your legs on our longer 22 km ‘Double Scoop’ ride to Grupetto Coffee in Dundas and back. * Best of all? Your support could make this generation the first to survive Duchenne muscular dystrophy. 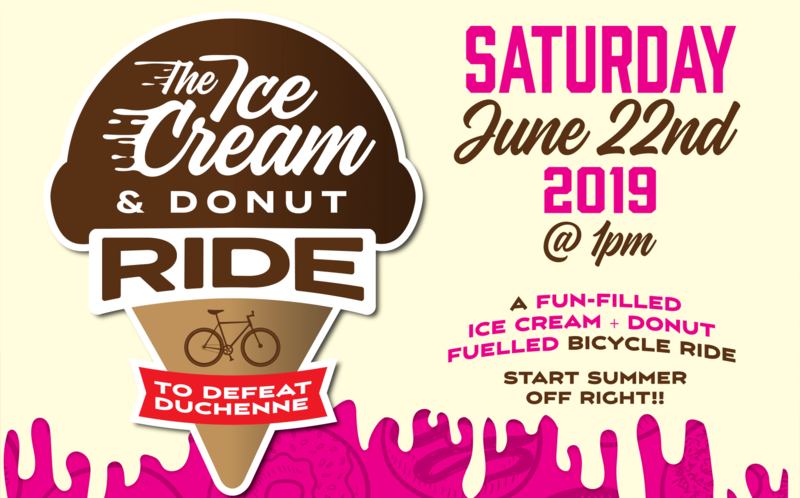 All riders who raise $50 or more in donations and pledges before June 10, 2019 will receive a limited edition Ice Cream + Donut Ride t-shirt! Riders who collect $50 or more in donations and pledges will get a limited edition Ice Cream + Donut ride t-shirt. All proceeds from registration and 100% of donations will go to support research into a cure at the University of Toronto Mississauga’s Gunning Lab via the registered charity Jesse’s Journey. Click here to learn more. Both routes start and end at Hamilton’s Bayfront Park. The 22 km ride will depart at 1:00 pm and the 6 km shortly after at 1:15 pm. The Ice Cream + Donut Ride goes rain or shine. Check out the car-free family friendly6 km ‘Single Scoop’ route here. Check out the 22 km ‘Double Scoop’ route through Westdale to Grupetto in Dundas and back along the Hamilton - Brantford Rail Trail here. From Hamilton's Bayfront Park to Grupetto Coffee in Dundas and back. Donut + chimney cone included. A family friendly, accessible and car-free 6 km route along Hamilton's Waterfront Trail from Bayfront Park to Princess Point and back. Donut + chimney cone included.